Good morning loves! Did you experience any sudden changes last week? It was very interesting to see what was happening with the people in my life, and I hope you all had some happy things happen for you as well :) This week the Sun moves into Gate 42 on April 11, and it’ll stay there until the morning of the 16th. This week is all about Gate 42. If you have Gate 42 defined (colored in) in your chart, you will notice this transit within yourself, if you don’t have Gate 42 defined then you will mostly notice this energy within your interactions. Either way, you will have access to it and will have the opportunity to take advantage of this transit. Click here to get your chart, if you haven’t already done so. Gate 42 is all about being able to jump into the middle of a situation and finish it. But of course, as with everything, only if your Authority says it’s correct for you. This is purely the energy to finish, not to initiate something. If you have a bunch of unfinished projects around the house (MG’s and Manifestors, I’m looking at you) then this week’s energy might give you the desire to complete some of these things, or bring you someone who wants to help. After this transit is over, it would be a good time to reflect on your (still) unfinished business and let some of that go. Seriously though, if you’re feeling more guilt and anxiety than excitement about finding the time to finish a project, give yourself permission to be done with it… especially if this transit didn’t send you the assistance you needed. 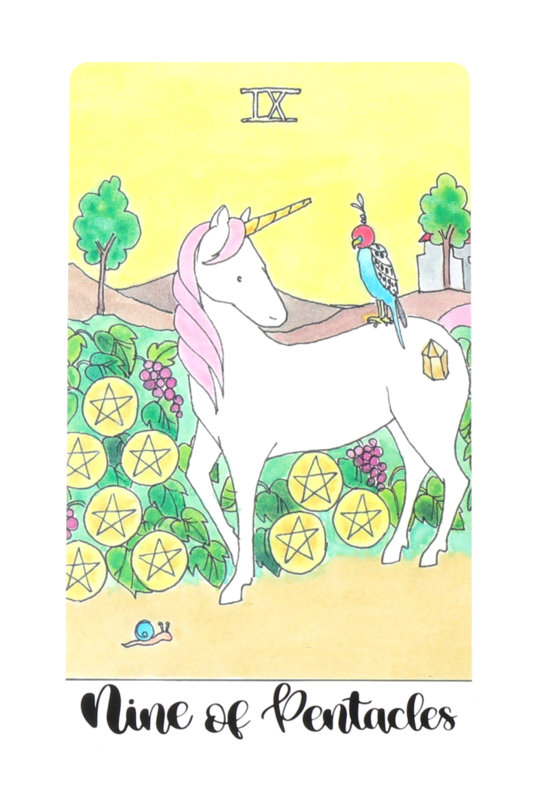 Gate 42 is represented by the Nine of Pentacles. When you follow your Strategy and Authority to enter into something that’s correct for you, you will be able to enjoy the fruits of your labor once you’re finished! THURSDAY: Today is for planning your week ahead. It’s an ideal day to make sure you have everything you need in your schedule, send confirmations for upcoming meetings, meal prep, write your weekly to-do list and set your intentions for the next few days. To get you started, I’ve included some thought provoking journal prompts to get you thinking about how to maximize this transit. How many unfinished projects do I have? Which of these things do I care about completing? Which of these things am I over? Did I follow my Strategy and Authority to get into these projects in the first place? Am I feeling called to help someone else finish one of their projects? FRIDAY: Today is a day where you may get noticed and called out. Think of the 2nd line Hermit on the Hexagram - she stays secluded in her little cave until someone notices her and calls her out, and at that time she is engaged with the world around her. A great day to stay put until a friend asks you for coffee, also not the best day to approach your boss about a desired promotion. SATURDAY: Today is a day of running into things, things catching you by surprise. It could be good or bad, such as getting unexpected news or bumping into an old friend that you’re happy to see. Can you get unexpected news on other days of the week? Of course, but today is the day when that energy is the most heightened. As far as the types go, (non-emotional) Projectors and Generators thrive on days like today and yesterday, because the energy is in their favor to receive invitations and have something to respond to. SUNDAY: Today is a day of completion via action. It could be low vibe or high vibe, such as someone getting fired or someone closing escrow and getting the keys to their new home. It doesn’t have to be that big, it can even mean finally going to your cable provider to cancel your service since you only watch Netflix anyhow. Since this is considered a transpersonal day, it’s a day where people are more likely to be friendly. Save your outside errands (especially shopping, this is the best shopping day of the week) for today and you will face them with more ease. Today, tomorrow and the day after that are going to be the best days for non-emotionally defined Manifestors and Manifesting Generators. TUESDAY: This morning is the last of the transit week, and therefore the day to relax in the way that’s best for you. If you’re pre Saturn Return however, today may be a day to do something wild. If you’re a parent, know that today your little one may be extra rambunctious. Regardless of where you’re at, today will be a day to reflect. Below I’ve got some journal prompts to get you started. Did I take care of any unfinished business this week? Did I help anyone else with their own projects? What do I have that I still haven’t found the drive to complete? Did someone in my life assist me with finishing a project this week? What have I discovered that I need to let go of?